Rentals Included All inclusive rental packages including tables, chairs, flatware, glassware, china, etc. Amenities Golf Course and Spa nearby. 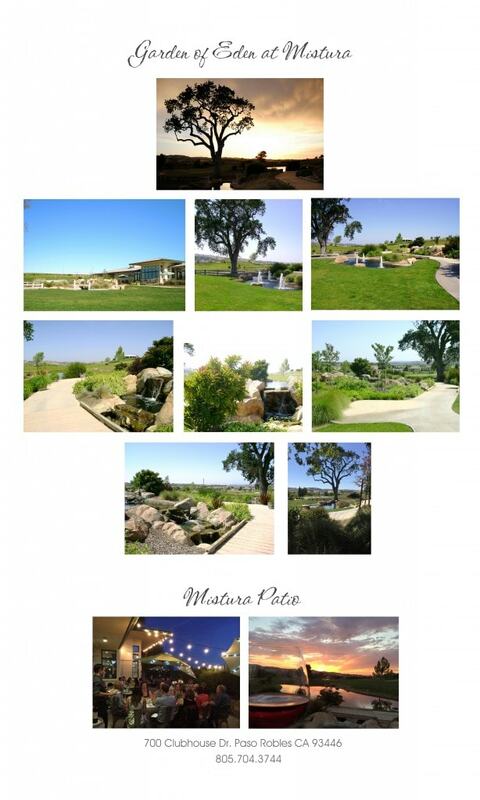 Mistura’s gorgeous and sublime grounds are the perfect setting to have your Private Event, from a romantic Wedding Ceremony and Reception to a Social Fete or a Corporate gathering. This picturesque area are located in the heart of Paso Robles Wine Country and will capture your heart and soul upon first glance. Mistura features al fresco scenery, surrounded by water fountains and majestic oak trees that encompass the evergreen and lush lawns. Accommodations are minutes away from Mistura, and there is even a Spa and Golf Course on the premise for clients and guests to enjoy!